We just wrapped up a great August long weekend in our house! Three nights of bonfires in a row really tuckers you out...but we had a great time with family and friends and can't wait for the next one!! In amongst party going and party planning I managed to get one lonely card done this past week - an anniversary card for Ryan. We celebrated 6 years on Sunday; the same day we celebrated Griffin's 3rd birthday! I've seen many cards similar to this and really like the simple concept; I was just waiting for the right opportunity to use it. I've actually started a notebook to jot ideas into so I can remember all the card ideas I want to use! Now if I could find a way to glue myself to my chair to get them made I'd really be in business LOL. I began by masking off the moon with a 1 3/4" circle punch from a post it note on Whisper White cardstock. Brayered over entirely with Perfect Plum, then just the bottom corner on an angle with Elegant Eggplant. Removed post it and sponged Daffodil Delight inside the moon. I then stamped the branch from the Take Care set in Basic Black. 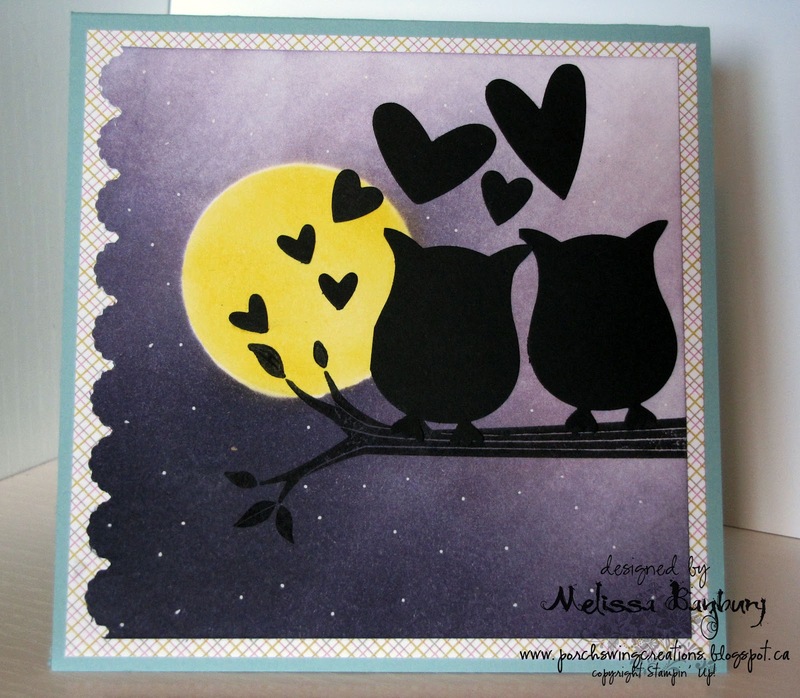 I added two owl's punched from Basic Black cardstock to the branch and randomly adhered hearts from the owl punch and the Heart to Heart punch around the owls. I finished by adding stars with a white gel pen. Congratulations. Great Card. Did I spy this over on SC gallery? I'll have to pop over and take another peek. TFS.